Attendance was up again this year to a new record of 56,614 attendees. 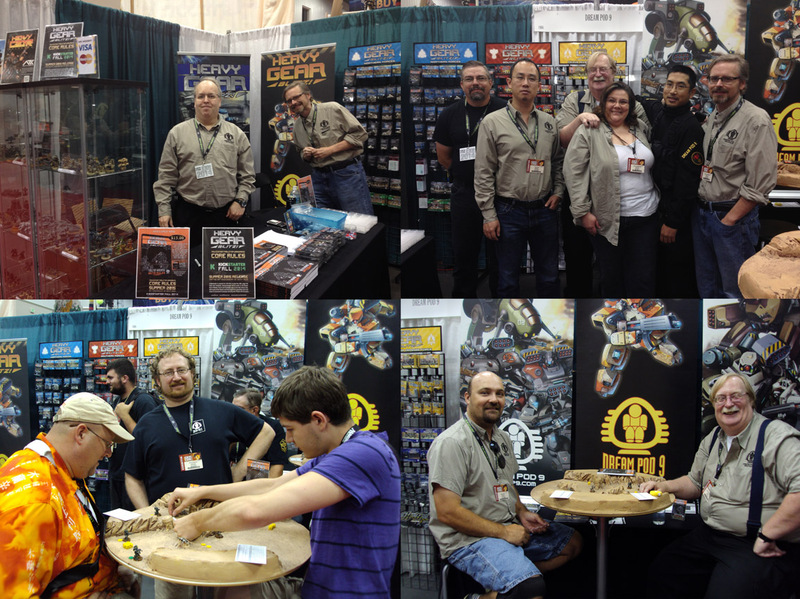 I took a few photos of our Gen Con crew and picked four to included with the Facebook post. Top left has myself, Robert Dubois, being photo boomed by Jason Willenberg. Followed by Dave McLeod, in the bottom left, running a demo of the New Edition Heavy Gear Blitz Beta Rules. Top right has a group shot of the most of the crew (left to right: Joe Johnson, Wunji Lau, Hugh Browne Jr., Jenny Willenberg, Avelardo Paredes, and Jason Willenberg) from Friday morning just before the hall opened to attendees. Bottom right has Mark Perre (left) and Hugh Browne Jr.(right) brushing up on the new rules before the hall opened. A big thank you to all the Gen Con Crew, helpers and fans who stopped by to say hello and try a demo game of the new rules. The Dream Pod 9 office will be open again starting this Thursday and we'll get busy casting up miniatures, with the goal of getting most of the orders shipped out next Monday. Also,we have decided to extend the Gen Con Week Promotion by one week until Wednesday, Midnight, August 27th. So you all have 1 more week to get the Exclusive Gen Con miniatures from 2012, 2013 and 2014. Plus take advantage of the special pricing of $94.99 USD on all the Faction Army Boxes and the $10 Off all the Faction Squad Boxes. Here is a direct link to the Gen Con Week page on the Dream Pod 9 Online Store for all interested.